Advantages: Full colour A4 format; wide variety of topics; respected writers; latest news and reviews. Conclusion: A magazine for all WWI aircraft enthusiasts that contains a diverse range of subject matter. Contributors are all well versed in their field and are only too happy to pass on their knowledge. 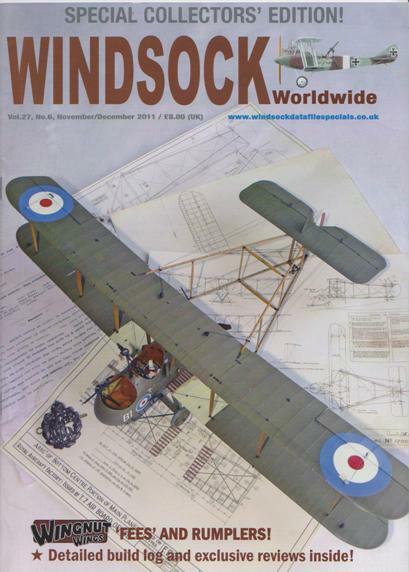 With six issues coming out annually, this is the final issue of Windsock International for the year. Its 32 pages are once again full of material that will be of interest to all modelers with a leaning towards World War I aviation. With the recent release of the Wingnut Wings 1:32 scale FE2b and Rumpler C.IV, it was obvious that one of these would be the magazine’s feature article. This time around it is the “Fee” that gets the editor’s attention. The author uses 12 pages to take the reader through a step-by-step process of how to get the most out of this kit. There are plenty of helpful tips along the way with over 70 colour images to compliment the text. For those wanting to add even more detailing, 2 pages from the original “Schedule of Spare Parts for the FE2b Machine” are also included. Lance Krieg continues his “Modelling Master Class” series with the 4th part of his informative look at struts and rigging. This time around we learn about turnbuckles and the different ways to replicate them. As always, dozens of images clearly illustrate the techniques used and it’s all covered over 4 enlightening pages. The 3rd installment of “Great War Paint” takes a look at the early and late versions of the Spad XIII. Avro Vercamer proves over a dozen interesting profiles which are spread over two colourful pages. Harry Woodman and Norman Witcomb pay tribute to the modelling skills of the late George Haddow and Ed Boll casts an eye over the US IPMS Nationals. Of course there is the usual roundup of book, kit, and decal reviews, which along with the latest industry news, makes this publication a fine resource for all WWI aircraft enthusiasts.